We take care of felt roofing in Nottingham! If it’s time to replace your worn out or leaky felt roof then don’t hesitate. Call us in Nottingham today and we’ll get round to you and sort out all of your felt roofing needs. You can rely on us to get the best job done because we’ve been installing felt roofs around Nottingham since 2001. We carry out our work with the highest standards of safety in mind – working at height installing felt roofs requires good working practice, and you can rely on us to do just that. We cover the whole of Nottingham, so we’re definitely a great choice when you require a felt roof, so give us a ring right away to see what we can do for you. Just dial 0115 815 7004. In choosing us you are helping support the local economy because we’re very proud to be a local Nottingham company. Our reputation around the city is built on quality workmanship, fantastic prices and top customer service. Felt roofs have a shorter lifespan than other methods, but they’re also the cheapest to replace, so they may suit you if you are working with a smaller budget. Felt roofing is durable and hardwearing, and can even be suitable for foot traffic, making it a great choice for over-room balconies. 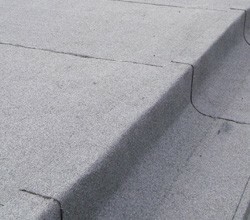 Felt can be installed on all types of and shapes of flat roofs, making it a versatile option that suits many scenarios. We’ll get things moving right away when we supply you with a free, no obligation estimate for your felt roof. Just give us a call to get the ball rolling. We have a great reputation after 10 years of quality roofing!